The Fender Custom shop are renowned for their great quality guitars, but they would greatly improve the playability of their models by paying more attention to final set-up process. The nut channels had been incorrectly cut parallel to the strings. A guaranteed way to nail those Ravi Shanker sounds! Since 1987 the Fender Custom Shop has produced special-order, limited edition guitars for their customers. 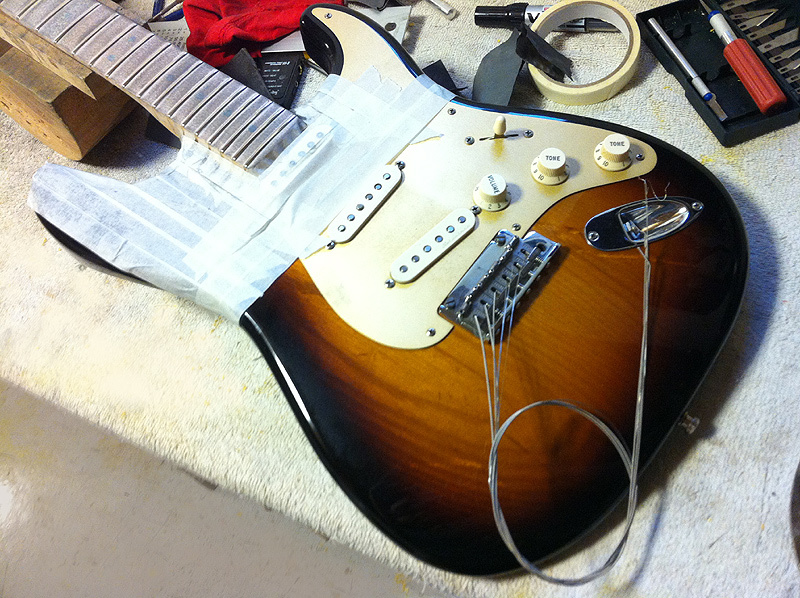 Much of the output is replicated vintage models such as the Fender Relic series, complete with scratches and general signs of abuse. You can spec anything you want – body-and-neck woods (type and grade of wood), matching headstock veneers, fingerboard-inlay designs, fingerboard radius, neck size and shape – Every single element of the guitar can be custom ordered. This 2003 Custom Shop Strat has a one piece alder body, Noiseless pickups, one piece maple neck and Sperzel locking machine heads. The owner Sam felt there were some set-up issues with the guitar including some fret buzz around the 9th fret and a harmonic sitar-like sound when playing the unwound strings in the open position. 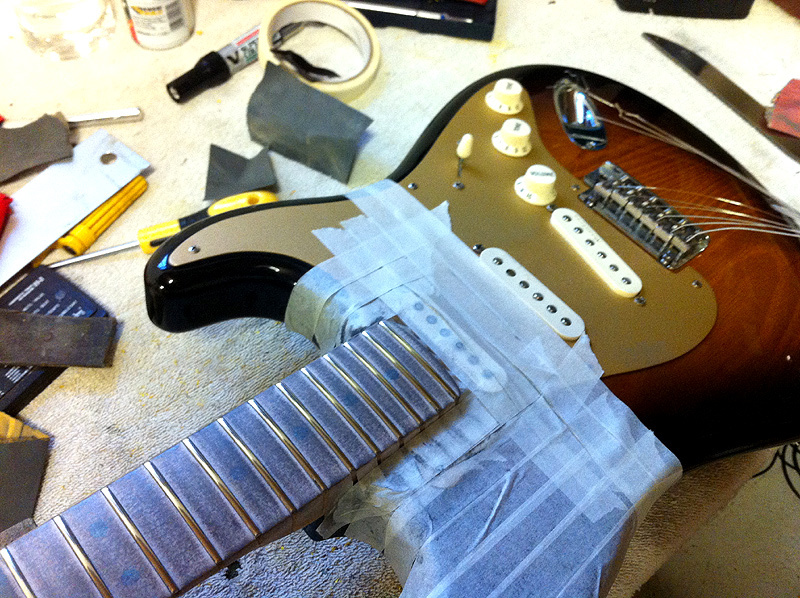 There were was also 10 years of fret wear and grooves that needed dressing. This neck has very pretty birds-eye feathering in the maple. The guitar is finished in nitro-cellulose lacquer. 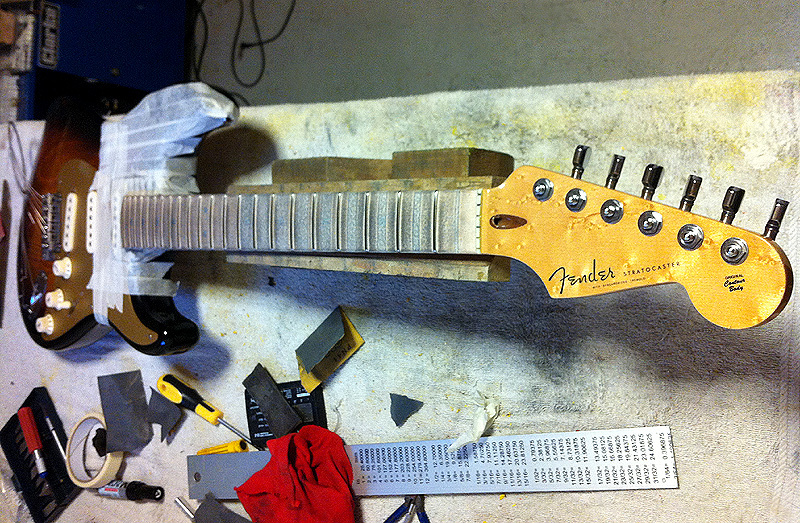 The neck had been finished after the frets had been installed. There was still some of this lacquer covering the edges of some of the frets. This needed scraping before the frets could be dressed. 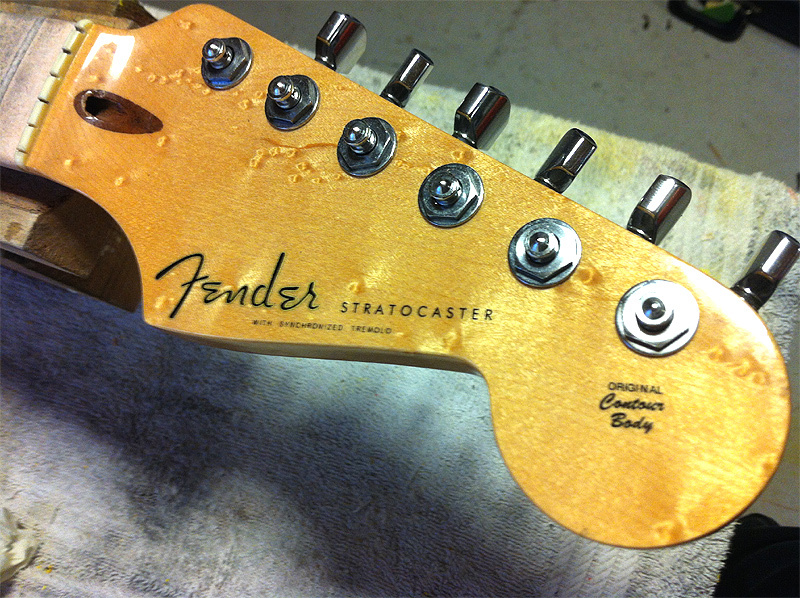 ← 1966 Fender Stratocaster Neck with Rosewood Fingerboard.